The PocketBook Touch model is a device for reading which combines all the best and most important characteristics of a modern reader. 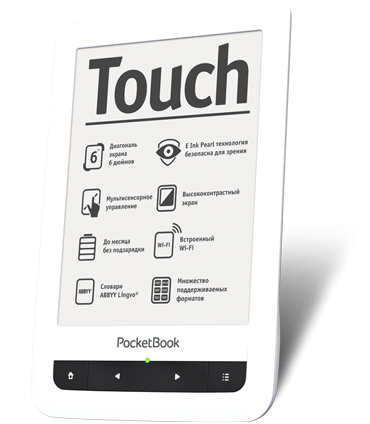 The PocketBook Touch display is based on E Ink e-paper technology. This revolutionary technology is defined by maximum visual similarity between the display of the E Ink device and a paper page: the display is inactive, only indirect light is used.The screen, 6" E Ink® Pearl, 166 dpi, with a resolution of 800x600 pixels, supports 16 grey gradations which allows the display of complex texts and illustrations. The PocketBook Touch display is based on E Ink e-paper technology. This revolutionary technology is defined by maximum visual similarity between the display of the E Ink device and a paper page: the display is inactive, only indirect light is used. The capacity of the built-in Li-Ion battery is 1100 mAh. Once charged, the battery will be sufficient for reading 8,000 pages. The device can work up to one month without recharging, provided the built-in Wi-Fi module is off. PocketBook Touch electronic readers provide fast Internet access. You can access the Internet in cafes, hotels, airports and other public places through Wi-Fi based on a built-in WLAN 802.11 b/g module. As compared to usual LED displays, E-Ink screens have no flicker effect which causes eye tension. As a result, your eyes get tired less as compared to reading from electronic devices with other types of screens (palmtop, communicator, telephone, laptop or a PC). You read on such a screen for hours without having to fear for your eyesight. PocketBook Touch works on an 800 MHz Freescale processor that supports a large variety of functions necessary for new-generation mobile equipment, including Wi-Fi and USB. In addition, the device has a built-in RAM of 128 MB which makes the Touch model an impressive sprinter among readers. PocketBook Touch is distinguished by its support of multiple formats customary for all PocketBook devices. The device supports 15 text formats - EPUB DRM, EPUB, PDF DRM, PDF, FB2, FB2.ZIP, TXT, DJVU, HTM, HTML, DOC, DOCX, RTF, CHM, TCR and 4 graphic ones - JPEG, BMP, PNG, TIFF. PocketBook eReaders support 1.6 and older versions of PDF files. Pre-installed ABBYY® Lingvo dictionaries will help you to find the meaning of new words without even closing the book. Pre-installed RSS-reader that easily sets up allows you to read all current news at your favourite sites. You can do it wherever you stay: in hotels, cafes, airports and other public places where Wi-Fi connection is available.